CHILEAN OMEGA, Full Chilean, great, proven bloodlines, born on June 21, 2008. Warrior Spirit x RE Olga. Love this full chilean paint beauty. Meg's sire is our beloved Warrior Spirit and her dam is Olga who has won a number of fiber contests and been a great producer for us. She reminds us of our girl, Liberty, also a great Warrior daughter. HRR CHILEAN FIREFOX, Full Chilean, born on July 25, 2005. Warrior Spirit x Chilena Viento. This is a Silverspirit and Chileno Machupicho granddaughter. This girl has style and stretch to burn with fine fiber and fabulous color tossed in on top. HRR CHILEAN OUTLAW JOSEY WALES, Full Chilean, born August 13, 2005. Warrior Spirit x RE Olga. Fabulous color of taupe and silver, stovepipe legs, a beautiful head and silky fiber. SECOND, Yearling Heavy Wool Males, Spokane Interstate Fair 2006 AND RESERVE GRAND CHAMPION, 2006 Heavy Wool Males, Spokane Interstate Fair. HRR CHILEAN MARIGOLD, Warrior x RE 369. Full Chilean, born on June 16, 2004. A female with incredibly warm red/honey high luster silky fiber, great conformation and an absolutely exquisite head. Thank you Bill Sharick and Amanda Capeheart, Sharehart Llamas, for your belief in our program!!!! HRR CHILEAN SABRINA, Warrior Spirit x RE 369. Full Chilean, born on June 15, 2003. A female with incredible red and white high luster silky, crimped fiber, great conformation and a beautiful head. The girl has a bowtie at her throat - she is ready for a formal event. Micron is 20.8. 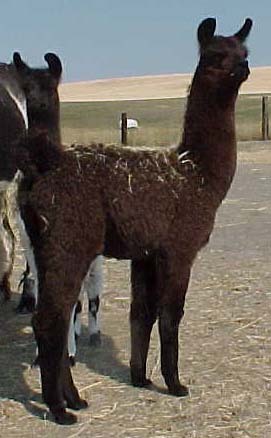 SECOND, Juvenile Heavy Wool Females, 2004 WILA Jubilee, ID. SECOND, Yearling Heavy Wool Females, 204 Happy Daze, WA. Thank you Luis, Lisa and Lauren Alayza, The Colorfield, for your belief in our program!!!! HRR CHILEAN BLACK BETTY, Warrior Spirit x Rhapsody. Full Chilean, born on June 14, 2003. A female with black high luster silky, crimped fiber, great conformation and a beautiful head. Thank you Brad and Syliva DeWaard for your belief in our program!!!!! HRR CHILEAN ARABELLA, Warrior Spirit x RE 369. Full Chilean, born on June 13, 2002. A female with black head and white high luster silky, crimped fiber, great conformation and a beautiful head. SOLD Thank you Sharon Rico for your belief in our program!!!!! HRR LIBERTY, Warrior Spirit x Genteel, born on June 21, 2001. Liberty is a tan, white and silver paint with great ears, wonderful stretch and a beautiful face. Liberty was 33 pounds at birth. Micron is 21.1! Liberty's fiber took SECOND in the 2002 LHOLS Show, Pennsylvania and FIFTH at the 2002 Midwest Challenge. FIRST, Medium Wool Juvenile Female, and GRAND CHAMPION Medium Wool Female, Happy Daze, 2002. FIRST, Medium Wool Yearling Female, and RESERVE GRAND CHAMPION Medium Wool Female, Spokane Interstate Fair, 2002. FIRST out of 46, Medium Wool Yearling Females, ALSA Grand Nationals. LIBERTY HAS HER ALSA ROM!! Thank you Charlie and Laurie Cornett for your belief in our program!!!!! HRR CHILEAN FRANKIE, Warrior Spirit x Juanita. Full Chilean, born on June 1, 2002. A female with grey high luster silky, crimped fiber, great conformation and a beautiful head. HRR BULLWINKLE, Warrior Spirit x Genteel, born on June 25, 2002. 15/16 SA. A male with brown gold high luster silky fiber, and silver points. Here is one to watch. This guy is getting more silver every day and his fiber is incredibly soft. HRR CHILEAN PALO WARRIOR, Warrior Spirit x Party Girl. Full Chilean, born on June 9, 2001. A male with black and white high luster silky, crimped fiber, great conformation and a beautiful head. Gorgeous coloring and a sweet personality on this young star, 33.5 pounds at birth. Micron as tested by Yocom-McColl is 22.0! Qualified for 2002 Regionals and Nationals. 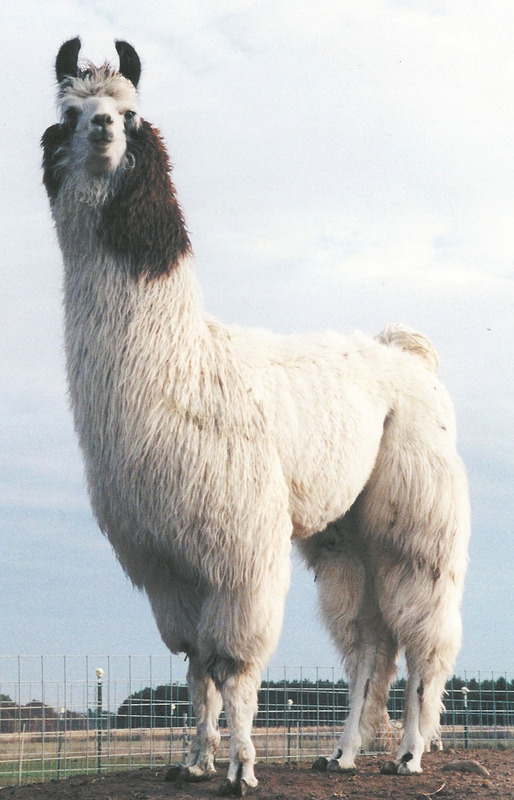 THIRD, Heavy Wool Juvenile Male, Happy Daze, 2002. FIRST, Heavy Wool Yearling Male, GRAND CHAMPION, and SUPREME OVERALL MALE, All Ages, All Divisions, Spokane Interstate Fair, 2002. Thank you to Dave and Deb Holte, John Porter and Duane Djerning for your belief in our program. HRR PAINTED WARRIOR, Warrior Spirit x Juanita. Full Chilean, born on December 19, 2000. 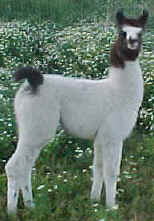 A male with black and white high luster silky, crimped fiber, great conformation and beautiful ears. PW's fiber test is back and his micron is 21.7. FOURTH, 2001 Estes Park Wool Market. 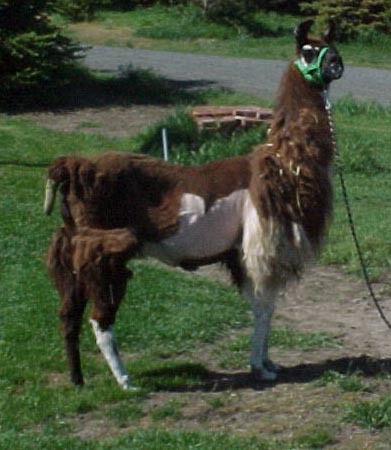 SECOND, Shorn Llama Under 24 months, 2001 Midwest Challenge Llama Show, Indiana. FOURTH, Llama Spinner's Choice Show, LOCC Fall Classic, 2001. 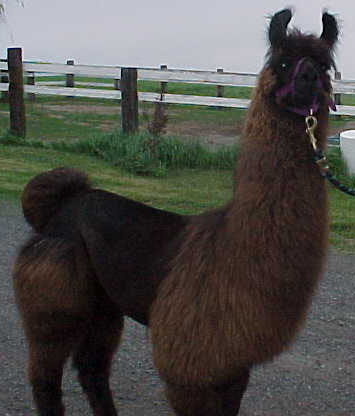 SECOND, Class E, Southwest Llama Breeders Fleece Show, 2001, Arizona. THIRD, Younger Single Coat, 2002 Virginia Classic. Thank you Anita Vake for your belief in our program. HRR RIMROCK WARRIOR, Warrior Spirit x WO Ruby Rose, born June 16, 2001, thirty pounds at birth. 1/2 Bolivian, 1/2 Chilean. A lot of neck and style here. Born with ear wool, this guy is going to have unbelievable coverage. 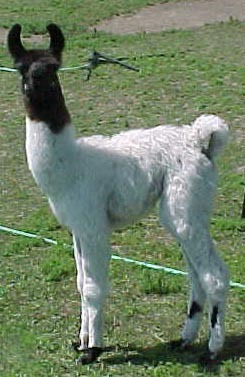 A male with beautiful black and white fiber, white on the tips of his ears, and wonderful neck extension. 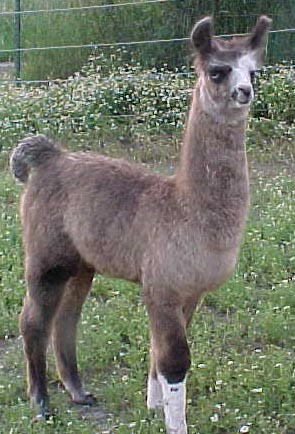 FIRST, Heavy Wool Juvenile Male, Happy Daze, 2002. Participant in FIRST place, Produce of Dam, Happy Daze, 2002. SECOND, Heavy Wool Yearling Male, Spokane Interstate Fair, 2002. FIRST, 2 Year Old Heavy Wool Male and RESERVE GRAND CHAMPION, 2003 Nebraska State Fair. Thank you to the White's in Nebraska for your belief in our program. HRR CHILEAN LAREDO WARRIOR, Warrior Spirit x RE Novia. Full Chilean, born on June 6, 2001. A tri-color male with brown, black and white high luster silky, fiber, great conformation and beautiful head and ears, 32 pounds at birth. Micron is 21.9! Qualified for 2002 Regionals. 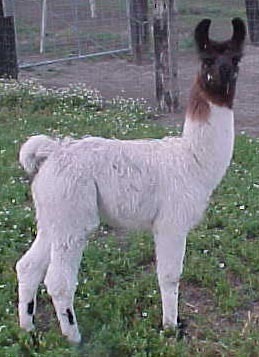 THIRD, Yearling Heavy Wool Male, Happy Daze, 2002. FOURTH, Yearling Heavy Wool Male, Spokane Interstate Fair, 2002. Blue, Spokane Interstate Fair, 2002. Thank you to Ann Hunter for your belief in our program. DUTCH FLATS ROSITA'S SPIRIT Warrior Spirit x Rosita. 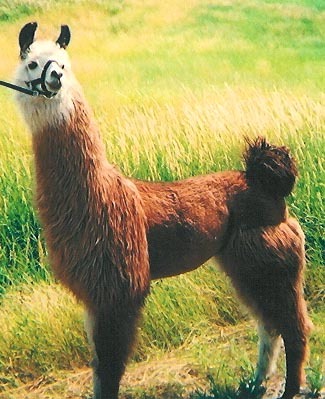 Born on June 10, 2000, owned by Brad and Sylvia DeWaard, Dutch Flats Llama Company, Washington. Rosita is the dam of Senor Rojo. 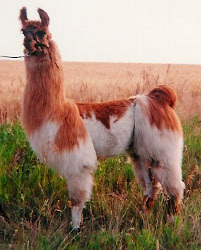 An incredible light red, gray and white female, full Chilean. 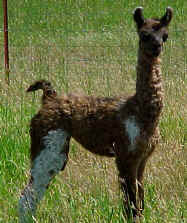 This cria has it all - perfect stretch, conformation, color and check out the fiber. 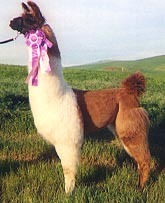 Rosita placed third of twelve at the 2001 Happy Daze show. Congratulations Brad and Sylvia!!!! HRR SAVANNA SPIRIT. Warrior Spirit x Dancing Delight. The first Warrior baby. 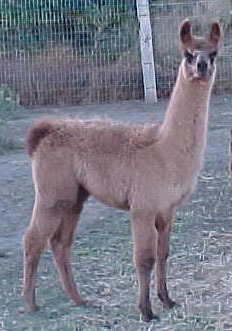 Savanna was born on May 28, 2000 and she is full Chilean with silky, high luster fiber. Her grandparents include Bonaparte, Duenna and Silverspirit. HRR DURANGO WARRIOR, Warrior Spirit x Rosetta Noel, born on June 5, 2000. 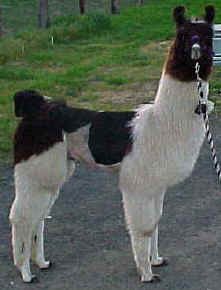 A flashy, stretchy black and white male, 13/16 Chilean, 30 pounds at birth, high luster fiber. A show and stud quality male. Thank you Mike and Debbie Fornari, California, for your belief in our program! HRR SILVERADO WARRIOR, Warrior Spirit x Genteel, born on June 7, 2000. Silverado is a platinum silver, with good ears (born with ear wool), wool over his toes, wonderful stretch and conformation. 32 pounds at birth, he is 15/16 SA. Thank you Susan Kovacs, Wisconsin, for your belief in our program! Susan showed Silverado to a 14th place in Juvenile Males at the 2001 Celebrity World Futurity! WARRIOR PRINCESS BDR, Warrior Spirit x LW Posey. Born June 2000, owned by Ron Preston, Oregon. 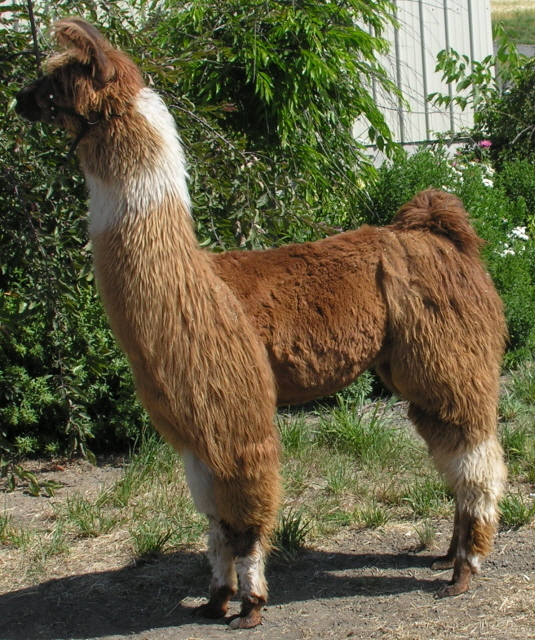 Full Chilean, a light red with gray ear fringe and a lovely silhouette. SOLTURA, Warrior Spirit x Matero's Careta. Born July 4, 2000, owned by Lauren Puma of Michigan. Full chilean with wonderful fiber and color. HRR CAMILLE, Warrior x Bijou. 15/16 South American (1/2 Chilean, 1/16 NA, the rest Bolivian) with the sweetest personality on the farm. 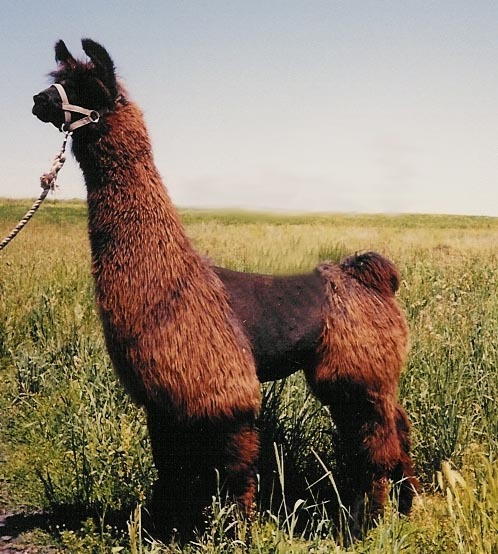 She is a warm chocolate brown with silky fiber and beautiful conformation. Thank you Lon and Marilyn Sharp, Washington, for your belief in our program! Updated by Donna Clark, 02/07/12 08:16:01 PM.